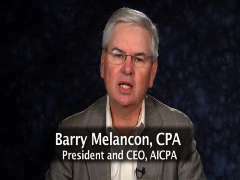 “The AICPA has been a steadfast supporter of the IRS’s overall goals of enhancing compliance by tax return preparers and elevating ethical conduct,” said Melancon.. But Melancon also posits that this issue crosses the line. The AICPA’s complaint is brought under the Administrative Procedure Act (APA), 5 U.S.C. §§551–706, and it alleges that the IRS violated the APA’s notice and comment requirements when it implemented the rule through a revenue procedure. The APA requires federal government agencies to provide for notice and comment, except when issuing “interpretative rules, general statements of policy, or rules of agency organization, procedure, or practice” (5 U.S.C. §553(b)). The complaint states that the revenue procedure implementing the program fits under none of these exceptions. The complaint also notes that the IRS cites no statutory authority that allows it to implement the new rule, and, under 5 U.S.C. §706(2)(C), without statutory authority, the program is invalid. Melancon and the AICPA also indicated that the IRS should immediately halt the program, seek advice and commentary from tax professionals, and utilize the tools and data the Agency already has in order to better monitor potentially unethical tax return preparers. The IRS initiated steps in 2011 to regulate unlicensed tax preparers for the first time, with a system requiring testing and education requirements. Previously the U.S. Court of Appeals ruled that the IRS did not have the legal authority of its own to establish regulations on over 700,000 tax return preparers not presently licensed as attorneys, accountants or “enrolled agents.” Consequently the Agency had to shelve its mandatory licensing program and ask Congress for authority to reinstate it. “Unless and until such happens, a voluntary program would be run,” the IRS said. The Agency has estimated that nearly sixty percent of U.S. tax preparers perform services without license or oversight, and with some doing a poor or even fraudulent job at it. Under the proposed voluntary program, participating tax preparers would register with the IRS, take 18 hours of continuing education each year and be tested. Passing such test would earn preparers a record of completion good for the filing season. About a third of the $9.4 billion tax return business is controlled by just four large companies. The remaining two-thirds is divided among licensed and unlicensed preparers, many of them small and sole preparers.